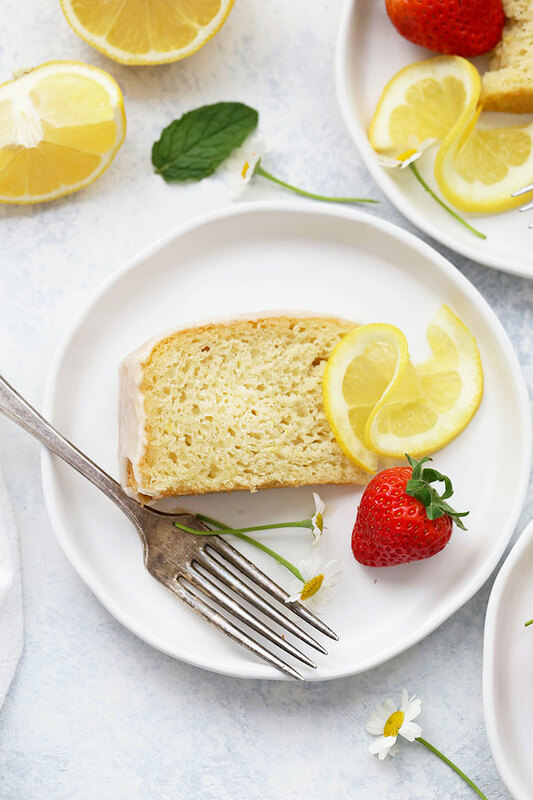 Gluten Free Lemon Cake – This bright, tangy gluten free lemon cake is like eating a bite of sunshine. Gluten free, dairy free, and absolutely delicious. 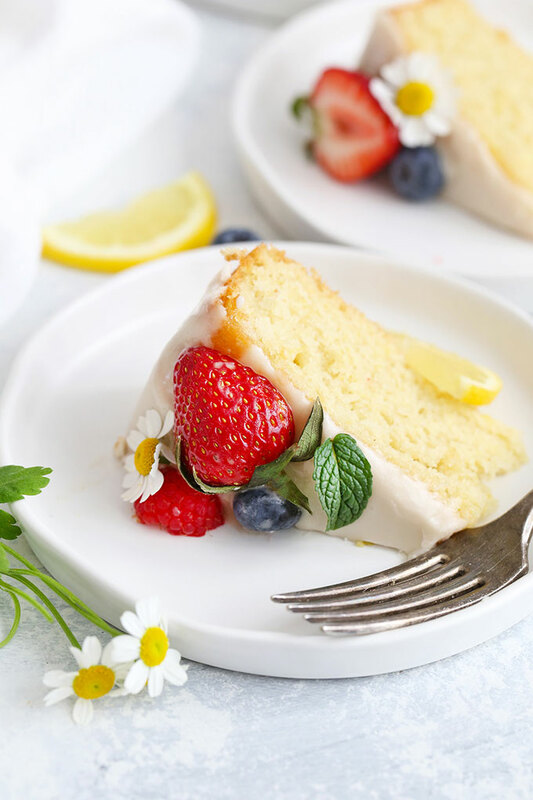 PS – Looking for a paleo/naturally sweetened lemon cake? 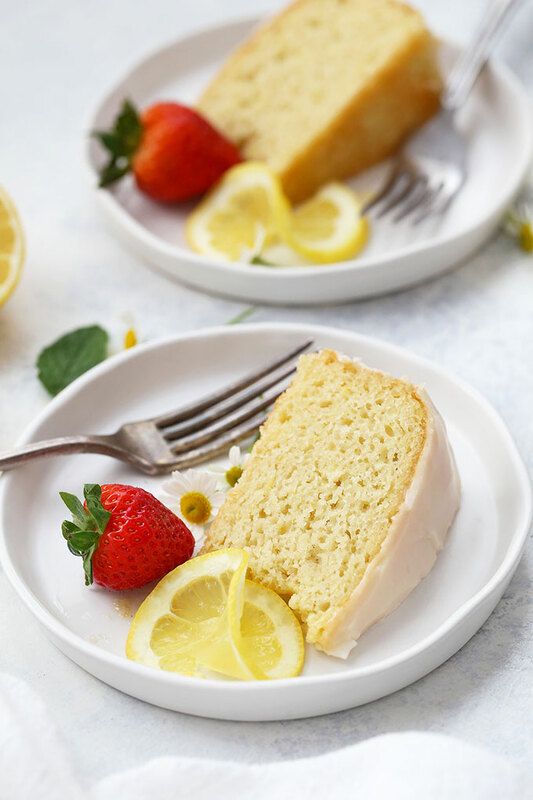 Try this Almond Flour Lemon Cake! I decided that, since nothing feels more like spring to me than a bright pop of lemon, I’d make a lemon coconut cake. I used one of Ina Garten’s recipes and, through no fault of Ina’s (love you, Ina! ), the cake was a disaster. About half of it ended up stuck in the bundt pan, but everyone was arriving in just a few minutes, so I thought I’d just try to cover the damage with a bit of shredded coconut. It made things worse. Just…SO. MUCH. WORSE. Thankfully, we were able to laugh about it, and I sort of closed my eyes while I ate it, and it all turned out fine. THERE’S A TRIPLE DOSE OF LEMON! You get lemony goodness from the cake itself (with lemon zest + lemon juice), then a second dose from the lemon-honey glaze you brush over the still-warm cake. Finally, you get a third dose from the white lemon icing on top. It’s lemon in every bite. Yum! IT’S GLUTEN, DAIRY, AND NUT FREE. 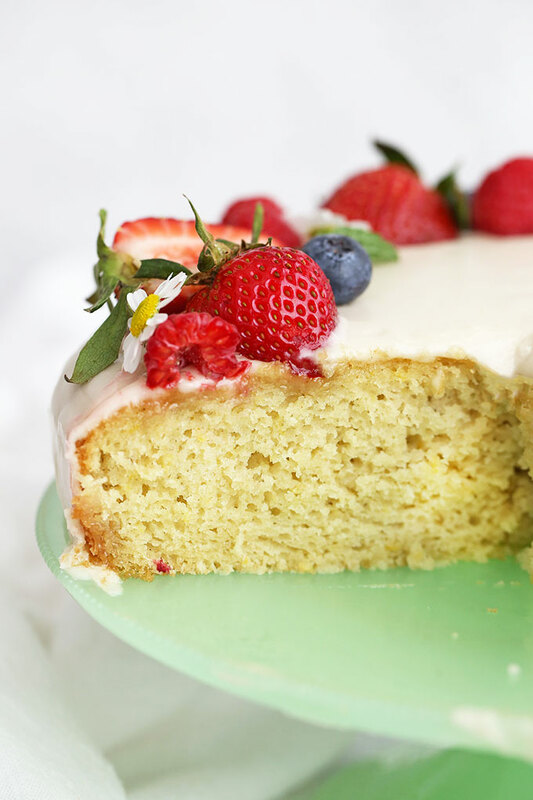 Last year, after I posted my paleo lemon cake, lots of you asked for a version with gluten free flour or white flour. This is it! I use a gluten free one to one baking mix, which keeps things easy (and gluten free!). Then, you can use non-dairy milk to fit your needs (nut free or not). I usually use unsweetened vanilla almond or cashew milk, but you can use whatever you drink–coconut, soy, oat, rice, or dairy milk if that’s your jam! IT’S SUPER LIGHT AND FLUFFY. Adding lemon juice to make a lemony faux buttermilk, and using a nice, light gluten free flour blend keeps this cake light. The two gluten free flour blends I like best for cakes are Bob’s Red Mill 1-to-1 Baking Flour and King Arthur Flour Measure for Measure. They’re a cup-for-cup substitute for white flour in recipes like this, and they have the perfect combination of gluten free flours and starches to give a light, fluffy result super close to traditional flour. BE MINDFUL OF THE PANS YOU CHOOSE. I bake my gluten free lemon cake in 9-inch round cake pans. You can use an 8×8″ pan if you don’t have a round cake pan, but you may want to check it a few minutes early, as it may cook faster. Also: darker pans cook darker and faster than lighter pans. I use these lighter cake pans and love that I get gorgeous caramelization without any burning. KEEP YOUR CAKE FROM STICKING TO THE PAN: Grease your pan and line it with parchment. It might seem silly, but I do both. I spray my cake pans with avocado oil spray (or coconut oil spray), or you can grease them with butter, vegan butter, coconut oil, or avocado oil. Make sure to pay attention to the sides, and get the bottom. Second, trace the bottom of your cake pan on a piece of parchment paper and cut out a circle of parchment. Then, place it on the bottom of the pan, and it’ll help the cake lift right up after baking. LET THE CAKE REST IN THE PAN BEFORE TURNING IT OUT. Give the cake about 10 minutes in the pan to cool a bit before you turn it out. This will allow the edges of the cake to slowly release from the pan a bit as the cake cools. (Cakes shrink slightly as they cool and steam inside evaporates.) It’ll also be less fragile and more likely to hold its shape when you turn it out of the pan. HOW TO TURN OUT YOUR CAKES. This always feels like the highest stakes moment of the cake baking process! If you’re nervous about getting your cake out of the pan successfully, I recommend watching this tutorial which walks you through 2 of the most common methods. I’ve done both with good results. Also: try not to hesitate–it’ll help! MAKE AHEAD TIPS. 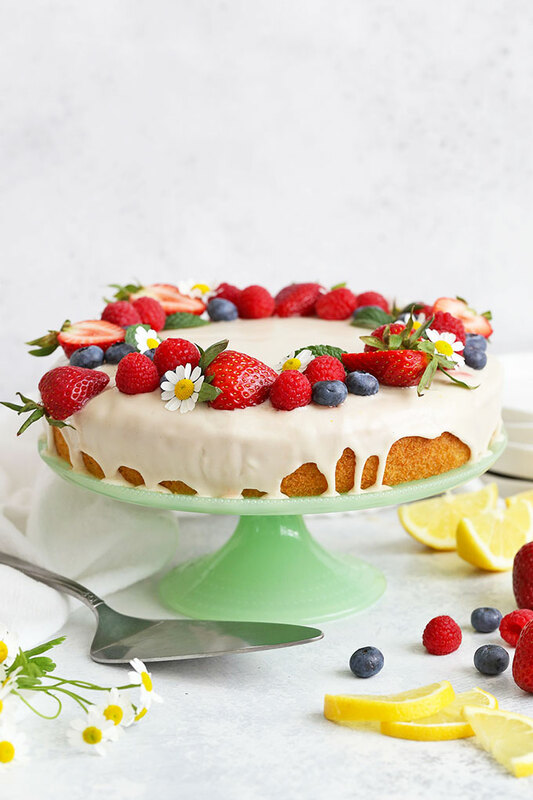 If you’ll be eating the lemon cake within a day, I recommend making the entire thing–bake the cake, brush with syrup, then glaze–and refrigerating it covered overnight. If you’re making it more than 1 day ahead, I recommend baking it, brushing with the lemon-honey syrup, and letting it cool completely before wrapping it and freezing. Thaw it in the fridge for a few hours before glazing and serving. Fresh berries – I use strawberries, raspberries, and blueberries. You can use one or a mix, just be sure that they’re washed and dried. If they’re still wet, they’ll slip off your cake or make the icing go runny. Candied lemon slices – Candied lemon slices work better than fresh since fresh lemon slices tend to be too wet. (The lemon juice cuts through the icing and can make for soggy cake). You can buy pre-candied lemon at Trader Joe’s, or you can make your own. Can I use a different kind of sugar? I haven’t tested this with liquid sweeteners, like honey or maple syrup, since other ingredient amounts would need to be adjusted. If that’s what you’re looking for, I suggest my paleo lemon cake, which is naturally sweetened. As for other powdered sweeteners, like erythritol/Swerve, I haven’t tried them before. I’d love to know how it goes if you give it a try! Can this be turned into a layer cake? I think so! I haven’t done it myself, but other readers have in years past with great results. You can halve it lengthwise after it’s baked (trickier), or divide the batter in half and bake in two pans (it’ll cook faster!). Then, you’ll frost it with your favorite frosting (rather than glaze it). Can I make it vegan? I haven’t tried it without eggs, but if you’re going to try it, I’d recommend starting with a powdered egg substitute, like Ener-G or Bob’s Red Mill. In recipes like this, a chia or flax egg can sometimes be a bit dense or add grit to your cake (which isn’t what we’re going for). Recipe originally posted March 2016. Post, recipe, photos and video updated April 2018. This cake looks delicious! I always get so nervous baking gluten free things because I’m terrified of using flour that doesn’t sound normal, but all of your desserts always look so yummy! I’m going to have to try them soon! The beauty of the 1-to-1 GF flour is that you can sub it for regular white flour, if you don’t need to bake gluten free! I made this today for my birthday! It was amazing! I used the coconut oil and milk but regular flour and I’m so so happy with this, I had to do some adjustment for higher elevation but the results are still phenomenal! I want to mix lemon zest with sugar for everything! Thanks for posting such incredible recipes. My mom has celiacs and I can’t wait to make her this and the brownies you posted. Seriously love your recipes so much! Oh, I’m so glad to hear it! Here’s to many more yummy cakes in the future! I made this tonight with Aldi gluten free flour and vegetable oil and served strawberries on the side. It was beautiful and delicious. The whole family loved it. Oh, I’m so glad you loved it! And glad to know of another flour blend that works well in the recipe! I used coconut oil and almond milk but my cake turned out in a gooey consistency. Am not sure what I did wrong. Lauren – I’m not sure… could you tell me more? We made this cake on Sunday for my husband’s birthday using coconut oil and almond milk and it was really fantastic. Was it perhaps underbaked? I made this cake for the 2nd time. First time it turned out wonderful and delicious!! One question I have is, how do I keep the glaze from melting and disappearing?? This 2nd time I made it and by mistake switched the baking powder and baking soda amounts ;( I took out as much of the bakingsoda as possible, but there was still a fair amount there. I decided to make small cupcakes instead of one big cake. They turned out beautiful and tasted really good. they were more fluffy then the first time, so all good. I’m glad they turned out okay in the end! The glaze can “melt away” a bit if it’s thin. To help with this, you can thicken the glaze a bit by adding more powdered sugar. 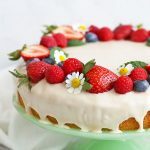 How can I adjust the ingredients for a sheet cake? Trissa – I haven’t made this into a sheet cake before, but I do think you could easily put this in a square baking pan instead of a round one without trouble. You may need to double the ingredients and then watch the baking time if you decide to try it for a sheet cake. If you give it a go, I’d love to know how it turns out! Well, I was thinking a 9″ round would not fill up a 13 x9 size. That’s my concern. Oh well, not a biggie. The cake is JUST what I was looking for…thanks so much!!! Does using regular milk, butter and sugar alter the “gluten free” on this recipe? I’m new to this and just want to make sure! Can you use a vegan egg substitute for this recipe? Will it still come out okay? Salina – I haven’t tried it with an egg substitute, but in similar recipes, it’s been okay for me! I’d say it’s worth a try! 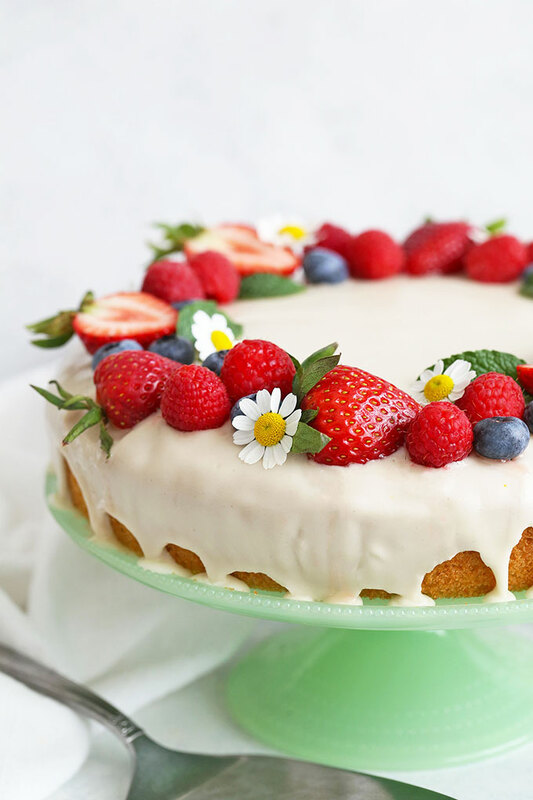 I liked using a powdered egg replacer for cakes since I get a lighter result (a chia or flax egg can be a bit dense or add color where I don’t want it). Bob’s Red Mill, Ener-G egg replacer and The Neat Egg have all worked for me in other recipes! It came out moist. I’m not used to the texture of the gluten free flower, but it was dense, moist and a bit grainy – my daughter told me it’s normal the texture and she thought the cake was delicious. My dad even had some and he doesn’t like sweets and commented on how amazing the glaze was. 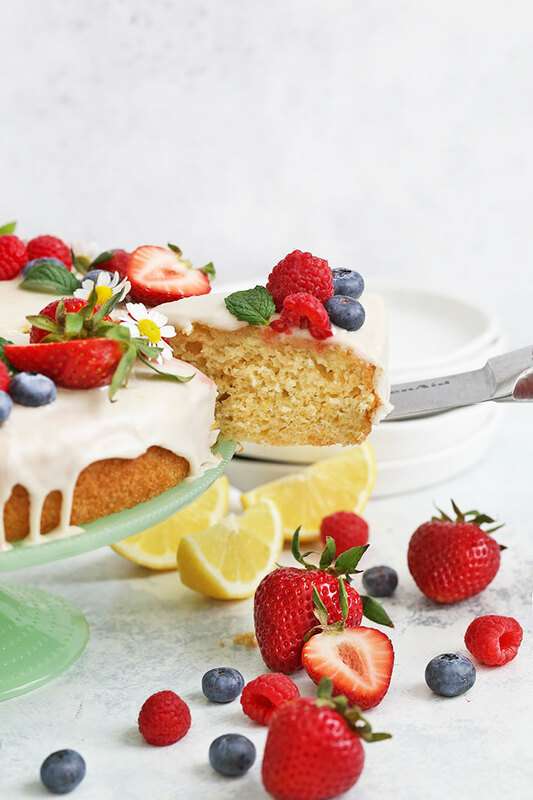 Zesty and sparkly lemon zing with a sweet, dense, moist cake. The only thing is I didn’t sift the powdered sugar and it did run/pool around the edges. I thought I had made it thick enough and the cake had been fairly well cooled. I think i can make it even thicker for next time. I used about 1-2 TBSPS more lemon than called for in each layering of lemon juice. Dove – Thank you so much for sharing this for me! I’m so glad the birthday girl enjoyed it as well! Oh, I’m SO glad they loved it! HI I was wondering if this needs to be stored in the refrigerator? The recipe is great! Thank you! Marina – I would, just to keep it as fresh as possible 🙂 So glad you loved it! I was wondering if I could substitute the sugar for coconut sugar, honey or maple syrup? Isabelle – I haven’t tried this one with honey or syrup. I do have this almond flour lemon cake (also GF) that uses honey as a sweetener. You may prefer that recipe! Otherwise, you can use coconut sugar, but it will alter the color of the cake. This is the best gluten-free cake I have ever eaten. Unbelievable! Thank you so much!! Carrie – WOW! You made my day. THANK YOU so much for sharing this with me! I’m so, so glad you enjoyed it! Hi, I was wondering what you recommend to substitute the honey with? My friend cant eat honey but the cake sounds delicious so would love to make it with something else for the honey. I just made this recipe yesterday for a little dinner party and it’s already gone. I made it vegan and used an 8×8 pan but otherwise stuck to the recipe and it resulted in a gorgeous springy cake with a great crumb texture and the perfect moistness. You can taste the lemon in each element of this cake and I want to make it again already. Michelle – Oh, I’m SO HAPPY to hear that! Thank you so much for sharing! 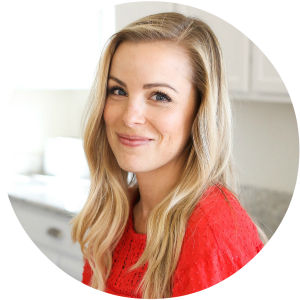 Cora May – I haven’t ever baked with sugar substitutes, but my friend Carolyn (All Day I Dream About Food) SWEARS by erythritol as a 1:1 substitute! I’d love to know how it goes if you give it a try! Excellent cake! Followed the recipe ingredients EXACTLY. The only thing was, I baked mine in an 8×8 glass pan. It wasn’t done baking until 42 minutes. Maybe being at a higher elevation changes the baking time? We’re at 4,500 feet above sea level. But really tasty! Would totally make again. Thanks for the great recipe! I’m so glad you enjoyed it! Glass vs metal or ceramic pans can make a difference (in general, glass takes a bit longer because it doesn’t conduct heat the same way that metal/ceramic do. And altitude can make a difference. Sounds like you’re totally on top of it!